Wisconsin Gov. Scott Walker came to Springfield Tuesday morning, to compare himself favorably to two Illinois politicians: Pat Quinn and Abraham Lincoln. Walker never mentioned Quinn by name -- he referred only the “Democrat leadership” in Illinois -- but he said he had balanced his budget without tax increases, while Illinois’s income tax hike has failed to eliminate our state’s deficit. Walker, who is facing a recall election in June, spoke to the Illinois Chamber of Commerce. Wisconsin Gov. Scott Walker paid a visit to Illinois on Tuesday, using the state and its problems as an argument as to why he should survive a recall election. But thousands of protesters were also on-hand in Springfield, arguing the Republican's actions are too extreme and creating a "Civil War" in the Badger State. Mary Ann Ahern reports. After Illinois raised its income tax from 3 percent to 5 percent last year, Walker and Indiana Gov. Mitch Daniels visited Chicago, on a mission to poach businesses for their states. Walker held up an old “Escape to Wisconsin” tourism bumper sticker. Walker also pointed out that Wisconsin added $1.2 billion to Medicaid, while Illinois is considering cutting the program by twice that amount, as well as laying off public employees. Wisconsin’s recall election is a result of Walker stripping public employees of the right to collective bargaining. 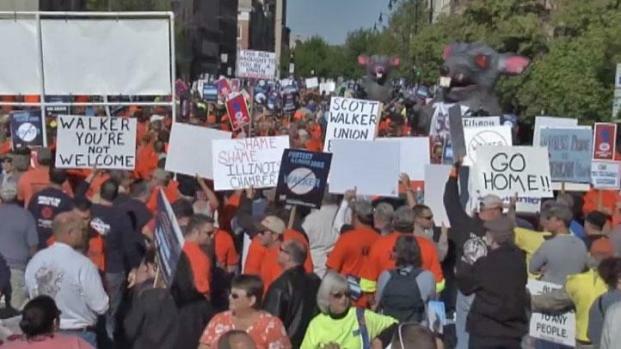 The crowd outside his speech was far larger than the crowd inside, as thousands of union members protested the governor’s appearance in Illinois. Walker addressed his enemies in the labor movement directly. “Members of my fan club are outside, many of whom were bused into Wisconsin last year,” he said. “What has made America great is that we’ve had men and women who’ve had the courage to think about their children and their grandchildren, not about their political careers,” he said. Buy this book! Ward Room blogger Edward McClelland's book, Young Mr. Obama: Chicago and the Making of a Black President , is available Amazon. Young Mr. Obama includes reporting on President Obama's earliest days in the Windy City, covering how a presumptuous young man transformed himself into presidential material. Buy it now!